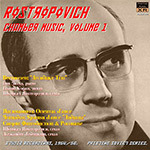 GRANADOS Spanish Dance 5: "Andaluza"
Mstislav Rostropovich made a large number of recordings for release in the Soviet Union at the start of his career. Many of these were picked up by Western record companies either at the time or since, but there remain undiscovered treasures still to be found. Here we mix the known and the unknown. It's no surprise to find the Archduke turned up in the UK in the early 60s, and it's been reissued since. But I can find no solid account of two of the three recordings with Alexander Dedyukhin that I discovered on a Soviet compilation LP of recordings by the cellist and which we present here. Both LPs were in very good condition, though the Soviet pressings weren't quite up to contemporary Western standards. XR remastering has done wonders for the rather dim original sound quality, and these recordings really are a delight to hear as a result. BEETHOVEN Piano Trio No. 7 in B flat, Op. 97 "Archduke"
This is as accomplished a performance as a glance at the names of the players would lead one to expect. I had not heard Emil Gilels in chamber music before; he makes a fine partner for Kogan and Rostropovich and seems to have a very clear idea of the primus inter pares role that Beethoven requires him to play in the Archduke Trio. A naturally commanding player, he succeeds in catching just the right air of authority here. I hope we shall be offered much more of him in chamber music. Not many years ago we used to be told quite regularly—and with some truth— that good chamber music playing could never be hoped for from a collection of virtuosi. From an ad hoc collection, no: the careless throwing together of soloists’ temperaments, such as we witnessed from time to time at international festivals, could scarcely be expected to generate much light. But the juxtaposition of strong musical personalities in chamber music can create excitement when properly managed. It does so here. Kogan, Rostropovich and Gilels play as one mind but at the same time as a mind with three facets; the performance benefits considerably from the individuality each retains. The playing as a whole is very strong and direct (though never forced or obvious) and I think that anyone expecting soulfulness and Innigkeit above all in the Archduke might at first find the performance a little unsatisfying. Yet it is never inflexible: there is nothing relentless about any of the tempi and one gets the impression that there’s always time for the detail in the music to make effect. It is possibly a little lower in emotional temperature than, say, the performance by Schneider, Casals and Istomin (Philips mono GBL5639) that I wrote about so enthusiastically in May last year. I’m still very taken with that record, in spite of the mediocre recording quality. I must admit, however, that the tempi on this new one are far more likely to find general acceptance. Casals started the Scherzo very slowly and made much of it sound almost rustic; with Rostropovich and his colleagues the movement achieves a more natural lilt— a little less magic, perhaps, but an altogether easier flow. (It is worth mentioning, too, that they observe the double repeat, a fact which makes their fairly brisk tempo seem essential; the Prades players on the other hand opted for a simple A В A + coda form and, as I’ve said, filled it out at a very deliberate pace—textually this can hardly be correct.) In the slow movement the Russians stick close to the andante cantabile mа però con moto Beethoven asked for; Schneider, Casals and Istomin attempted the near-impossible here and brought off a moving, wonderfully rapt adagio. It is probably not going to be very illuminating to pursue comparisons further. This new record arrived rather late for review and I haven’t had time to play it more than once. I doubt, though, whether subsequent hearings would cause me to modify my initial impression, which is of a perceptive, noble and justly proportioned interpretation almost impeccably executed. But I’m also quite sure that I shall continue to delight in the old Philips record and to find equal, if different, pleasures there. The only general fault I can level at this Russian performance is that its dynamic range is rather restricted. This may be the fault of the recording, not of the players: though adequate in all respects it is not strikingly good in any and the quality of the sound does vary quite noticeably.